There’s a whole lot of music that I really like right now. 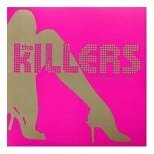 Just today, was listening to the radio at the office and heard “Somebody Told Me” by The Killers. Really fun song. Jasmine said it sounds like something she heard at 80’s night at this club in Pittsburgh. So, the question is – is this a cover of an 80’s song, or is it an original by The Killers. Island Records has a cool eCard for them, which plays the song, go and listen to it here. And here’s a link to their CD on Amazon.com.